I don't think any of this makes sense. Thus the 30 and 100 swapping south terminals makes no sense. As for the 95 and 100, there is sufficient ridership along 93rd between Cottage Grove and Woodlawn to justify the current routing. Remember passengers living south of 93rd in that area do not have access to 95th due to the railroad tracks running along 94th. Also there is little residential area south of 95th between Cottage Grove and Woodlawn that is served by the current 100th on 95th and the 4 and 115 on Cottage Grove. If I would do anything, I would return the 100 to it's original Jeffery Manor loop and restore the 106th routing back to the 106, even if only for rush hours only. While the commercial corridor along Commercial would no longer be served,Lake Pointe Plaza would still be served & there would still be one accessible along 95th btwn Jeffery & Yates, complete with an ALDI. Furthermore, transfers could still be made to the J14, 15, 26, 71 & the proposed 30. When I used to visit friends on that section of 93rd, I just walked from 95th st (if I was coming from that direction) if a 100 or 111 came before the 95E. My experience is not everyone else's, of course. That said, thank you for the feedback. Where would I find old maps of the 100's & 106's original routings, the wayback machine had nothing for me? Where would I find old maps of the 100's & 106's original routings, the wayback machine had nothing for me? With the ongoing shortage of buses at Pace West for PM rush service, I wonder if there could be a plan to have other Pace garages or even CTA's K or C do fill ins? I have been waiting in the cold as some buses never show up, sometimes two in a row don't show. 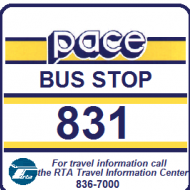 If Pace West knows they are going to be short, I would call K to see if they could send 2 buses to cover the 317 and I would use those buses to cover where my shortages are..
Maybe they should have garages under the same leadership instead of a separate union/division for each. Maybe that way they can just borrow on the spot like CAT but that's a LOOOOOT of miles. I know right? Separate divisions and separate union rules if unionized. I feel you on that blue line one. Shame about the lack of space to build it there. Reminds me of DC, where the red line is isolated from the rest of the system, bar one connection to the green line. Issue that Brentwood Yard (DC's Skokie Shops) is on the red line, and the connection only allows southbound trains (read: trains coming from the suburbs) in from the green line to cross onto red line tracks. Getting trains Brentwood Yard is a logistical nightmare. Made me think about all the possible complications of switching cars off the blue line. Having thought about, I wish Polk & IMD were closer to facilitate a transfer. I looked at a track map for the DC Metro. It looks like there is also a single track connector near the Farragut stations. It leaves the Red Line south of Farragut North and ends up on the Rosslyn bound track on the Blue Orange and Silver Lines. It’s called the A&C connector on the map. I don’t know if it has been dismantled or anything, but it also looks like it’s a bit disruptive to normal service if a train were to use it. I’ve been on charter trains that have done the switch on and off the Blue Line. From my observations I think the main disruption is to the Pink Line. On trains transferring to the Blue Line, you just have to let the signals know you’re entering the Forest Park tracks. And if you need to switch directions, you can pull into Morgan Middle Track and get out of the way of road trains while you prepare to reverse direction. Transferring off of the Blue Line doesn’t really disrupt the Blue Line either since you just have to work the route selector at Racine to go up the ramp, but once you get up to the Pink Line there is no middle track to enter while you switch directions, so if you need to go to the Loop and Skokie, you’ll need to use the switches to get onto the Loop bound track. On the charters I’ve been on, they’ve had an operator at each end of the train to quickly turn the train around, but if you’re alone you better work fast.